Treat yourself to one of the best days out at sea you can have along the East Coast of Cyprus. Relax on the rigging nets of the twin hulled catamaran as the pleasant sea breeze revitalises your body and spirit. This is one of the most popular boat trips from Ayia Napa with options for families, groups and couples. Transport from your Ayia Napa hotel is included and you will be transferred to the Green Bay jetty, in between Ayia Napa and Protaras where you will set sail from. The catamaran cruises are all-inclusive so you can enjoy a tasty buffet lunch on board. There is also an open bar so you enjoy as many refreshing drinks as you'd like. The cruise will take you past the busy beaches of the popular resort of Protaras, past the smaller bays and coves of the East coast towards the Famagusta ghost town viewpoint. You will also be able to view the dramatic rocky coastline of the Cape Greco natural forest park and the beautiful Konnos Bay nestled in between the pine trees. There are several swimming stops included where you can experience the fresh crystal clear waters of the Mediterranean, snorkels and kayaks are available on board. 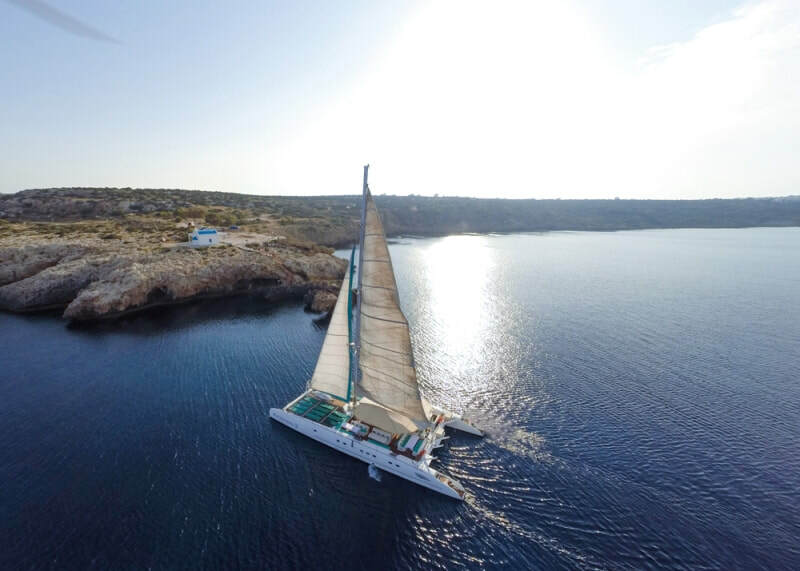 The Mediterraneo II Catamaran has nets with mattresses for sunbathing, shaded seating area and a bar area. There are toilets and a freshwater shower on board. You are welcome to use the snorkels, masks and canoes available and the boat has free wi-fi on board. There are 4 catamaran cruises available for you to choose from - More information on each can be found below. All cruises include return transport from your Ayia Napa hotel, an open bar and buffet lunch or dinner. VIP cruises are adults only, with an upgraded menu and a limited number of passengers on board. Book your tickets at least 48 hours in advance to guarantee your places, these trips sell out quickly.